The idea for this exhibition (see review below) originated in 2003 at a forum in Delhi, organised by the Indian National Trust for Art and Cultural Heritage (INTACH). The presentations and discussion at this forum made it obvious that there were serious threats to the future of New Delhi from developers and others but that there was also a strong body of conservationists and local citizens who were campaigning to save the city from potential destruction. It was also obvious that many in the audience had little idea of the work or career of Edwin Lutyens before the creation of New Delhi; or of the influence which building there had on his subsequent work. 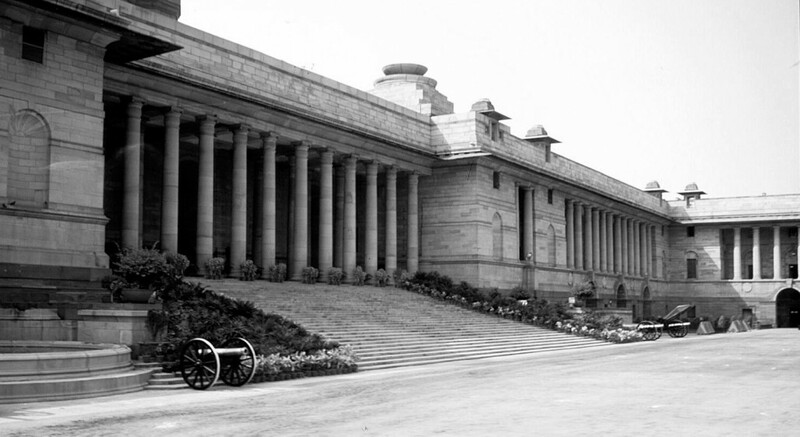 This prompted the proposal that there should be an exhibition in India to show how Lutyens’s earlier work developed, how New Delhi came to be designed and examples of the influence of Delhi on his later work: hence the exhibition title “Rashtrapati Bhavan in Context: the Work of Sir Edwin Lutyens O.M.”. The exhibition was curated by Margaret Richardson and Paul Waite. It needed many months of planning, negotiation and implementation and the Trust is enormously grateful to Margaret and Paul for seeing the whole process through from conception to successful launch. We are also very grateful to The British Council for allowing us to mount the exhibition in their fine gallery; to Richard Stagg, the British High Commissioner, for opening the exhibition as guest of honour (and for his and his wife’s hospitality later at dinner); to the Office of the President of India for the loan of important items from Rashtrapati Bhavan; to INTACH for their unfailing support and advice; and, not least, to BP India, for providing sponsorship. The opening of the exhibition marked the start of the visit by 60 Lutyens Trust members to New Delhi over the following six days. Paul Waite had also devoted many months to planning and organising an intensive programme, during which we were able to visit a large number of interesting and important buildings: not only the better known ones by Lutyens and Baker but also buildings from the earliest days of New Delhi and others which followed on from the Lutyens period and which demonstrate his continuing influence. The Trust is again very grateful to INTACH for helping to arrange access to many of the buildings and to the many people responsible for the buildings themselves, for the warmth and generosity of their welcome. The exhibition and visit coincided with renewed reports of plans to redevelop – or otherwise alter for ever – substantial areas of New Delhi. There have been similar reports before but, at present, the threat seems very real. The Trust is taking steps to work with conservationists and other concerned Delhi residents in their efforts to resist these encroachments and preserve this great garden city as a hugely important element in India’s cultural heritage. These steps are in their early stages but include (suggested by an important supporter in Delhi) the formation of a chapter of The Lutyens Trust in New Delhi, to provide focus and co-ordination for conservation initiatives there. The Newsletter will be reporting further as this very important debate progresses. The exhibition was generously sponsored by BP India and curated by Margaret Richardson and Paul Waite. It was opened by the British High Commissioner, Richard Stagg, and the Chief Executive of BP India, at the Private View on Friday 5 October 2007. Edwin Lutyens real historical significance arises from the contribution his work makes to India’s rich and varied cultural heritage. Rashtraparti Bhavan – the Viceroy’s House – is now firmly embedded in modern India’s political life. In the sixtieth year of India’s independence demonstrating the importance of the building in Lutyens’s work was a valuable critical project. The Trust hoped that the exhibition might contribute to the greater understanding of the importance of New Delhi as a heritage site of international significance. Lutyens’s work had not, up to the date of his appointment to the Delhi Planning Commission in 1912, included colonial buildings nor work on the scale required for the new imperial site. As Henry Russell Hitchcock wrote of the building in Architecture Nineteenth and Twentieth Centuries in 1958 “There is a certain irony that this opportunity came to an Englishman trained in this most individualistic and private way”. The exhibition opened with Lutyens early houses and showed how, in the early 1900s Lutyens moved from the informality of vernacular design to the discipline of the classical tradition. The Viceroy’s House, as a culmination of this transition, was particularly clearly demonstrated in the exhibition. The British Council building, designed by Charles Correa in the early 1990s has a square formal plan, with a central courtyard faced, like Rashtraparti Bhavan, with red Delhi sandstone. In the central hall of Correa’s gallery, which is a fluid Frank Lloyd Wrightian sequence of exhibition spaces, stood the enormous model of the Rashtraparti Bhavan and its gardens, and surrounding this on the walls one could see the full circle of Lutyens’s transition from domestic Surrey designs to the Imperial scale. horizontals of Delhi red sandstone are both modern and conservative – as are the vernacular charms of his country houses. 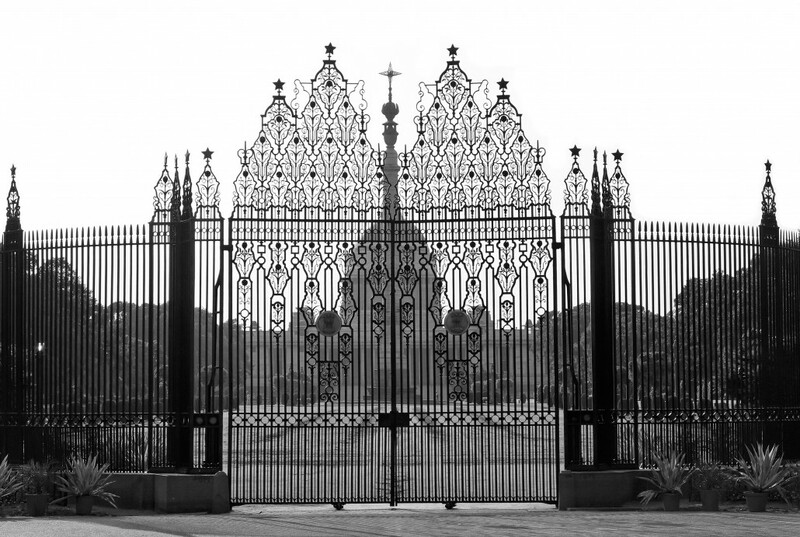 When Mervyn Miller was interviewed at the opening of the Lutyens Exhibition in New Delhi a journalist discussed with him the crisis in the Bungalow Zone and a recent report that a decision had been taken by the Senate that the Government would develop this area. This would eventually mean the demolition of over a thousand bungalows and change the green character of the Zone. 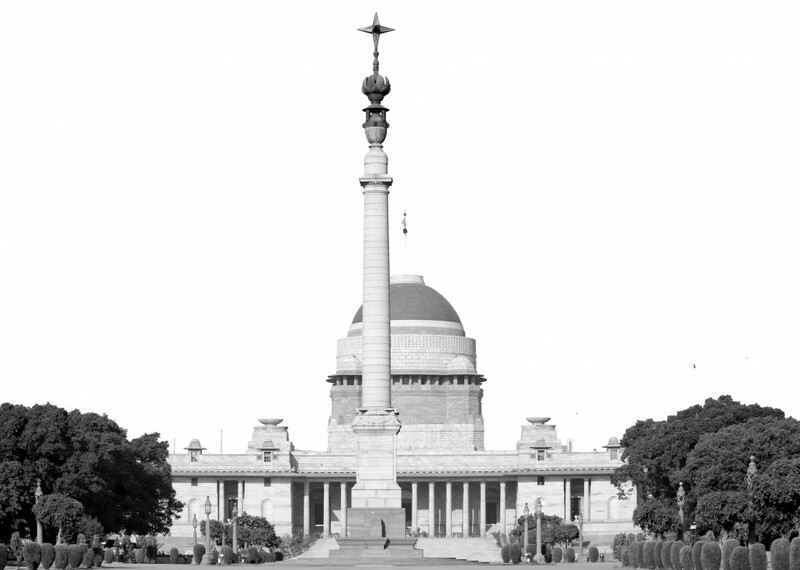 The Lutyens Trust has long been aware of the threat; regular reports have been given by S. K. Misra of INTACH, who suggested the Trust might contribute to the debate by organising an exhibition to show the evolution of Lutyens’s architecture. One of the aims of the Lutyens Trust visit to New Delhi was to specifically examine the Bungalow Zone. I took the opportunity of extending my visit to see the new city of Chandigarh and the summer capital of the Raj at Shimla. The literature on the building of New Delhi is extensive and I do not intend to give a detailed history of the development of the Bungalow Zone and its relationship to the Rashtrapati Bhavan and the Secretariat Buildings. Similarly the history of Chandigarh is well documented. This essay is my own response to the very carefully structured tour of buildings, which Paul Waite skilfully arranged, culminating in a visit to Rashtrapati Bhavan, where we were allowed to climb the dome and see New Delhi laid out before us. The contrast between Old and New Delhi was vividly impressed upon us on the first day. We drove past the Red Fort through Old Delhi, Shajehanabad, to the northern outskirts where the original English cantonment and civil lines had been established by the British in the 19th century. Among the buildings we visited were Vidhan Sabha (the former Secretariat of the Civil Lines, now the seat of the Delhi Legislative Assembly), which was redesigned by E. Montague Thomas in 1912 to house the Central Secretariat when it was moved from Calcutta. We then moved to the Vice-Chancellor of Delhi University’s Office, formerly the Vice-Regal Lodge, that had been built as an official guest house for British officers c.1900. These elegant, whitestuccoed classical buildings were very reminiscent of Nash’s Regent’s Street arcades, now destroyed. Coronation Park, the site of the 1877, 1903, and 1911 Durbars was visited to see the solitary figure of George V (sculpted by Charles Sargent Jagger) standing in what is now a desolate area of Delhi, surrounded by appalling housing and tent encampments. After a long rush hour drive we returned to New Delhi and the green Bungalow Zone to see St. Martin’s, the Garrison Church (1928-1930) designed by Arthur Gordon Shoosmith, which served the military community in New Delhi. Nothing had prepared me for the scale of the Secretariat Buildings and Rashtrapati Bhavan on Raisina Hill rising like the acropolis in Athens. The Presidential estate and Bungalow Zone provide a verdant setting for these mighty buildings. The axial street plan specially planted with trees, which could survive in a harsh climate, converge on the Raj Path culminating in Lutyens’s masterpiece. The concept is imperial. The planning of the Bungalow Zone carefully reflected the social structure of the Raj. Lutyens, having planned the area and put his stamp on it with the planting, did several designs for bungalows c.1916 – 1923 but these were rejected by the Delhi Committee. Fortunately Lutyens designed two palaces for the premier princes of Hyderabad and Baroda, which we visited. Other houses were designed by W.H. Nicholls, Chief Architect to the government of India and by his successor Robert Tor Russell. 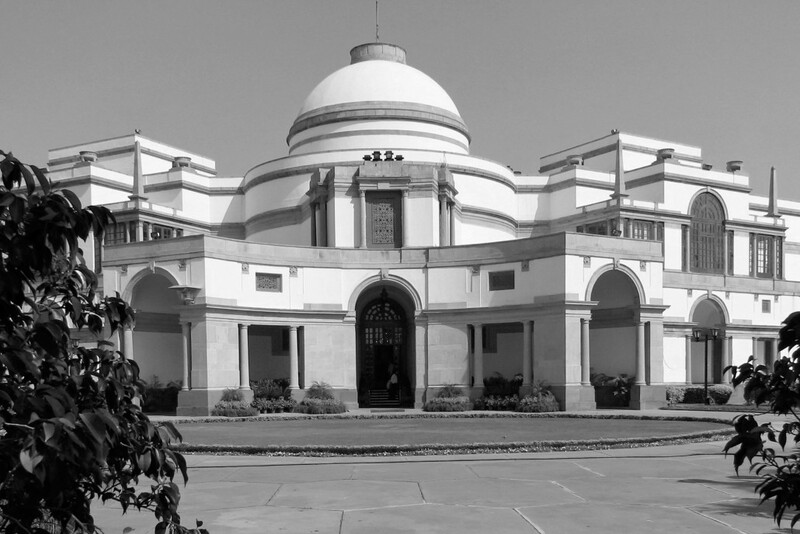 Lutyens humorously referred to Baker’s ‘bungle ohs’ and in some cases the architects are unknown, but they all provided houses in a range of styles, some of extreme sophistication, which were for a short period in the 1930s the centres of social life in New Delhi. This highly structured Raj society ended with World War II and the subsequent Independence of India in 1947. Some of the princes’ palaces have highly suitable uses; others have fallen on hard times and into dilapidation. Less important bungalows are used as embassies, educational institutions, Indian regional offices; others have survived as private homes. Hyderabad House was a palace designed for H.E.H. the Nizam of Hyderabad and built between 1926 and 1928. It stands at one of the intersections of the avenues by the Memorial Arch, where it was decided to build the houses of the most important princes. It was one of the first palaces we visited and is now the hospitality centre for the Indian Government. It was the costliest of the princes’ houses (£200,000) but suitably smaller than the Vice-Regal Lodge – there was a pecking order! It was certainly the most lavish and elegant, maintained to a very high standard. Hyderabad House has a butterfly plan with a domed central entrance hall and wings radiating at 120° to relate it to the road. It is dazzlingly white, faced in stucco with stone dressings. On the neighbouring block is Baroda House, built on a similar plan for the Gaekwar of Baroda (1921 – 1933) which is now Indian Northern Railways House. This building is in a sad state of dilapidation and much altered internally to make offices for clerks. A cement floor has been inserted in the domed two-storey saloon. The welcome the Lutyens Trust received was warm and we viewed the presentation of the plans proposed by INTACH for the restoration of this building. One hopes they will be realised. The Gaekwar was an enlightened prince, educated by the British and happily married to a Rajput aristocrat. His was a monogamous relationship. Lutyens was not required to provide a zenana and the female members of his family did not live in purdah. His granddaughter, Gayatri Devi, a princess of Cooch Behar married the Maharajah of Jaipur in 1940 and her evocative memoirs recall the lives of the princely families progressing between their states, New Delhi, summers in the hills and visits to England, and tea with George V! The third grand house we visited was Teen Murti House, formerly the official residence of the Commander-in-Chief of the British Indian Army and designed by Robert Tor Russell (1929-1930). It stands on the side axis of the Vice-Regal Lodge to the north and is carefully graded in scale to reflect the comparative status of the Commander and the Viceroy. In 1947 it became the residence of Jawaharlal Nehru, the first Prime Minister of India, and is now the Nehru Memorial Museum. Russell designed it in a very restrained classical style, employing stucco and contrasting stone. On the garden side paired columns form a shady loggia on the first and second floors recalling Inigo Jones’s Loggia in the Queen’s House overlooking Greenwich Park. A long building, with suites of rooms arranged off the central corridors on either side of the entrance; it retains its restrained panelled decoration and 1930s furniture. Here we were shown around by Professor Rana, our Patron in New Delhi and former Government Architect, who regaled us with anecdotes about Lutyens; evidently his first question on arriving in Delhi had been ‘where are your nurseries?’ – not for children, but for trees! Among the smaller princely residences we viewed was Travancore Palace, formerly the residence of H.H. the Maharajah of Travancore built in 1929-30 and now the property of the state of Kerala. It was an exquisite, almost beaux-arts house, built on a butterfly plan, which would not look out of place in the Bois de Boulogne in Paris. Now it is run down, under multi-occupancy, though the Kerala authorities would like to regain possession of the whole building and renovate it. It stands on several acres of land, which can only be described as a rubbish dump. This visit focussed the mind on the problems of re-development; whether to restore the original house and develop low-rise domestic housing in the garden, or clear the site and build high-rise. A most elegant house was the residence of the Resident Commissioner for Jammu and Kashmir, which is attributed to Edwin Lutyens and Walter George (see article by Mervyn Miller). A restrained classical building set in immaculate lawns, it provides residential accommodation for representatives from Kashmir. Similarly the Institute of Archaeology is now housed in a small classical single storey bungalow, built on a butterfly plan. The architect and original owner are not known. This has recently been restored. The international luxury style, Art Deco, was employed in several houses including Faridkot House, now the National Commission on Human Rights (formerly the home of H.H. the Rajah of Faridkot). The architect is not known. On the ground floor was a grand reception room decorated with typical Art Deco rectilinear mirrors, but the hidden gem in the building was the Maharani’s bedroom suite, which evidently the family still use on visits to Delhi. It is an example of the most luxurious Art Deco interior decoration, still furnished with its original fittings, and an en suite fitted dressing room and bathroom. This suite recalled the Art Deco interiors which were fashionable in the inter-war years in Europe, reminding one that the élite families had an international taste. Similar Art Deco taste could be found in the home designed by Walter George in 1933 for the Singh family, who built much of Lutyens New Delhi, which is now used as the Hungarian Cultural Institute. The entrance façade of The National Defence College, formerly the UK High Commission, was also built in the Art Deco style. Institutional occupation of all these buildings ensures that they are kept in a good state of repair. In preparation for the Commonwealth Games in 2010 the Metro has been driven through the Bungalow Zone and at one stage runs parallel to a typical street of houses, some of which are still occupied by the families who built them. Many have been subdivided and they have large gardens. Members of the party photographed them realising that they were under threat. The housing we visited was very much accommodation for the élite though when we visited Rashtraparti Bhavan, we did see briefly the housing and amenities Lutyens had designed for Presidential Estate where over 3000 estate staff now live. In the early evening throngs of Indians gathered on the grass around the Memorial Arch to promenade and meet their friends and obviously enjoyed the open spaces. Viewing the zone either from the vantage point of the dome of Rashtrapati Bhavan or the roof top restaurant of the Taj Mahal Hotel, one realised the problems. The high rise Taj Mahal building breaks the tree line and more tower blocks would change the character of the area, but certainly in the neglected areas there are opportunities for re-thinking the use of the land. Following the extension tour to Agra and Jaipur, my journey continued to Amritsar, Chandigarh and Shimla, which in some ways completed the political odyssey of my visit to India. Amritsar, the holy city of the Sikhs, has a troubled past. Since the Partition it is now located on the border with Pakistan and the political tension is palpable. The daily ceremony in the evening of lowering of the flags at the border gate was a scene of intense Hindustan nationalism. The memorial in the Jallianwala Bagh commemorates the massacre of Indians in 1919 by General Dyer. The Sikhs, who led the uprising demanding independence for the Punjab in 1984, resulted in Mrs. Gandhi ordering the destruction of one of the Sikh temples, and ultimately led to her assassination. It was Amritsar’s proximity to the Pakistan border, which precluded it from becoming the capital of the Punjab in 1947, and led to the building of Chandigarh, in east Punjab at the foot of the Himalayas. Chandigarh and New Delhi have one thing in common which is the magnificent planting of trees. One’s first impression is of regularly wide roads, avenues of trees and the absence of beggars. The architectural concept is totally different to that of Lutyens’s New Delhi. It is self-consciously anti-imperial and reflects the change in political direction after 1947. 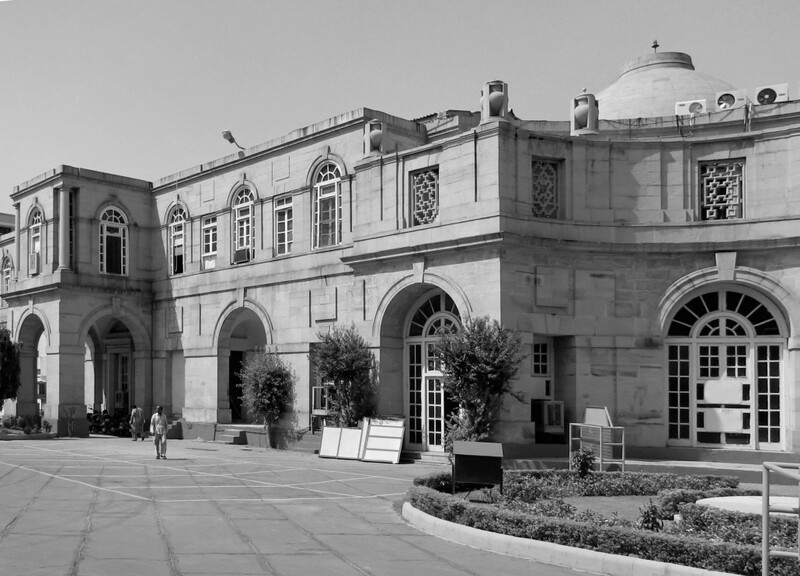 There was a lack of Indian technological expertise and initially the Punjab Government, encouraged by Jawaharlal Nehru, deliberately turned to the architect Albert Mayer, an American planner working in India, for the design. The untimely death of his associate, Matthew Novicki, and increasing problems with currency exchange with the USA resulted in turning to Europe and they consulted Charles-Edouard Jeanneret, Le Corbusier. The commission to build a new capital presented him with a similar opportunity to the creation of New Delhi given to Lutyens and Baker. Like Lutyens he realized he could not accomplish the whole task himself and the English architects, Maxwell Fry and Jane Drew joined him to realize the residential city, while he designed the government buildings. It presented the husband and wife team, Fry and Drew, with an opportunity to realize their theories on housing. The city is built on a grid pattern and each sector is self-contained, providing a range of housing and services. Unlike New Delhi there is no main axis leading to the government buildings that are situated on the northern boundary in what was meant to be parkland. It is deliberately anti-hierarchical. Le Corbusier designed the Secretariat, the Assembly and Judiciary buildings, which were built. The Presidential Palace was not realized. The Judiciary faces the Assembly across a vast concrete court, and to the side of the Assembly is the Secretariat to which it was linked with paths on the ground and elevated walkways, reminiscent of the South Bank complex in London. The architecture of these buildings is imposing. The Secretariat is an administrative office block with a roofscape which recalls the Unité d’ Habitation in Marseilles and the internal stairwells and ramps have their look-alikes in the Hayward Gallery! The side entrance into the Assembly brings one to cavernous halls on the scale of Piranesi’s Carceri. The circular Assembly Chamber for the Punjab takes one’s breath away and colour plays a crucial part in the design. The main entrance doors to the building, designed by Le Corbusier, were presented by the French State, and are opened only once a year, and located directly opposite the Judiciary. In front of the main façades of both these buildings are stretches of water, which is rather murky. Le Corbusier’s scheme is sadly diminished by the current political situation. In 1966 the State of the Punjab was separated on linguistic divisions into the Punjab and the state of Haryana, so the Secretariat offices are now divided and guarded by the military forces of both states. Fences have been erected between the buildings, so there is no free flow of people, indeed access is totally restricted. The space between the Assembly and Judiciary, which should be used as car parking and thronged with people, is an empty fenced space and only the Judges can drive to the main entrance of the Judiciary. Politics and security issues have swept aside Le Corbusier’s attempt to realize a more democratic ensemble of buildings. The final blow to the scheme is the use of concrete, which has weathered very badly and little has been done to keep it in good repair. This contrasts with the use of very high quality stone in the Rashtraparti Bhavan and Secretariat Buildings in Delhi. The city has worn much better. Here there is total rejection of the separation of different areas – the military cantonment and civil lines planned as exclusive areas, serviced by a native population living elsewhere. Nehru had had to contend with this in Allahabad when he was Chairman of the Municipality in the 1920s. Within each sector there is housing provision ranging from villas recalling Le Corbusier’s work at Villa Stein de Monzie to social housing for state employees, which are serviced by shops, a post office, schools and medical facilities. The University campus is one of the most successful educational centres in India. On the eastern edge of Chandigarh an artificial lake was created with a recreational lido, which was crowded with people enjoying themselves, and the central Mall provides excellent shopping. No high-rise building is allowed in Chandigarh and it is a highly desirable place to live, and this is reflected in the property prices. As a working city it appeared to me to be a greater success than the Bungalow Zone and possibly some of the ideas could be translated into the redevelopment of some of the land in New Delhi, without compromising Lutyens’s overall plan and the planting. Shimla was the summer capital of the Raj, and Lutyens was famously critical of the architecture: ” If one was told that monkeys had built it all one could only say, ‘What wonderful monkeys – they must be shot in case they do it again'”. It was first settled by British army officers in the early years of the 19th century on a precipitous tree covered ridge. They were allowed by the local chiefs, who owned the land, to build as long as they did not cut the trees or kill the cattle. The other tribe who inhabit Shimla are the monkeys, who in an almost human manner confidently roam the streets and hillside. The bracing air soon attracted Europeans escaping the heat of the plains and initially they built cottages and bungalows in the clearings. The materials available were limited; they used a traditional Himalayan framing system, embellished nostalgically with decorative features recalling Surrey cottages or Swiss chalets and the roofs were made of corrugated iron. The Vice-Regal Lodge, which is built in a Scottish baronial style, was begun in 1886 and stood on Observatory Hill, a promontory that was linked to the other end of the ridge, known as the Mall, where the Gothic Anglican church stood. These very idiosyncratic buildings would not have appealed to a man of Lutyens’s aesthetic sensibilities. The ‘monkeys’ were the English wallahs. Lutyens must have seen the monkey population and knowing his sense of humour chose to denigrate the architecture by attributing it to the animal population. Sometimes I think people wilfully misinterpret him. The Vice-Regal Lodge is now a centre for Post Graduate Indian Studies, with the Burma teak panelled hall and ballroom the library. An exhibition of contemporary photographs is a visual record of the whole cast of the Raj, finishing with Lord Mountbatten signing the document of Independence. Shimla is now the capital of Himachel province and flourishes as a popular Indian resort. Studying the architecture of these cities is also an introduction to the socio-political history of India and my visit to New Delhi, Chandigarh and Shimla was a three-week seminar on the Raj, the diaspora of Independence and modern India. There is much to think about, and one hopes that the Lutyens Trust can make a constructive contribution to the debate on the fate of the Bungalow Zone, which with the Government complex on Raisina Hill is one of the most spectacular architectural achievements in the world. Arts Council Exhibition, Lutyens, Hayward Gallery, 1982. Ravi Kalia, Chandigar. The Making of an Indian City. Oxford India Paperbacks, 1999. Mervyn Miller, Delhi Diary 2007. Privately circulated. the International Planning History Society, held at New Delhi 11-14 December 2006. Privately circulated. One of the most welcome features of the itinerary of the 2007 Delhi trip was the opportunity to visit and review buildings designed by architects who began as assistants to Lutyens or Baker, then branched out on their own in the 1930s, and maintained high quality design through the 1950s and beyond. Walter Sykes George (1881-1962) was a hero of the evolution of late and post-colonial architecture in India. He travelled to Delhi in 1915, as Baker’s representative, having already achieved distinction at the Royal College of Art in London, and a Soane Medallist. He worked on the Secretariats, but commenced independent practice in 1925, with important princely and commercial commissions. His architectural style had a classical basis of proportion, and reflected a modernising influence, relying on manipulation of building form, rather than intricate detailing. Naturally, the work of his architectural mentors, Baker and Lutyens, was influential, but the modern classicism of Giles Gilbert Scott is also apparent, with a geometrical massing that also evokes the work of Frank Lloyd Wright. This is most evident in St. Stephen’s College, on the Delhi University Campus, completed in 1939. 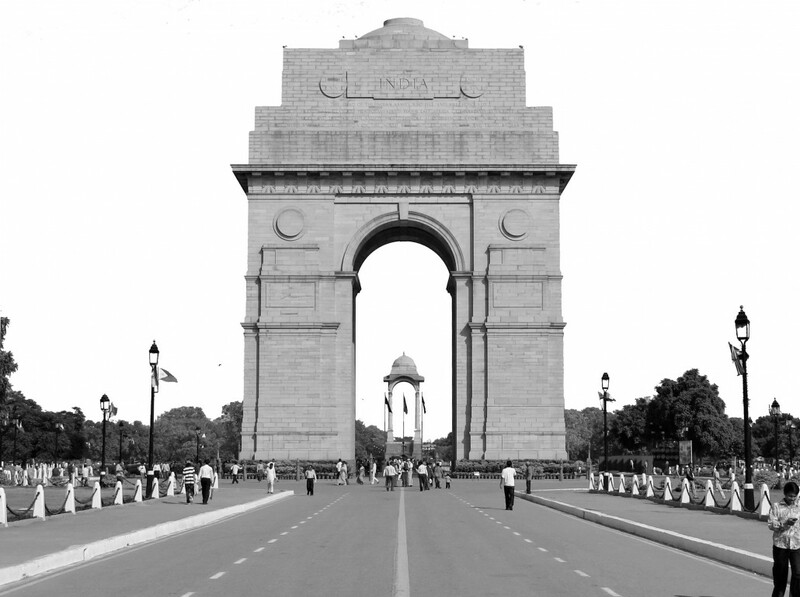 Lutyens had prepared a sketch design in 1917, but this was India Gate apparently rejected. George’s buildings, with a Delhi quartzite base and meticulously detailed red brickwork are almost timeless, laid out around shady quadrangles, with cool colonnades and broad corridors, admirably adapted to the local climate. The rooflines are punctuated with small chattris, and in the centre a tall tower, reminiscent of Giles Gilbert Scott’s contemporary University Library at Cambridge, anchors the complex. The small chapel was built a few years later, suitably lofty and with an octagonal turret with an ogee cap. The Faculty of Arts followed in 1947, virtually a tad more institutional but still a fine building. His work for the princes included Jhind, Mandi and Bahawalpur Houses. Time has not treated them well. The latter, built in 1939, is now the National School of Drama. George cheekily combined Italianate loggias with coupled columns, with a central dome that reproduces that of Rashtrapati Bhavan in miniature. I’m not sure that it comes off, and for me it represents a portent of what Lutyens’s masterpiece might have looked like, had the original intention for white marble facing been carried out. Admittedly, George used white-painted stucco rather than gleaming crystalline marble, but I know that I prefer the Dholpur sandstone facing on RB, to a whitened sepulchre. Pottering around near Connaught Circus, I found Scindia House, which George designed for the Maharajah of Gwalior. It must once have been a fine building, but that perception relies on the eye of faith: it is now a warren of tour operators’ offices. St. Thomas’s Church, 1932-5, was built to serve low caste Christian converts. Its receding cubic massing picks up Lutyens’s elemental sculpture at the Thiepval Arch, 1924-32. Internally, the arched structure stretched along the Nave, towards the Apse, defining narrow circulation side aisles. The building had suffered over the years, from intense damp penetration, subsidence and earthquake damage. The latter had brought the tower at the eastern corner crashing down into the Sanctuary, which was rebuilt lower, and the top of the tower was not replaced. Primitive wooden corsets remained in place on the outer wall. The brickwork had also been painted over red, with white lining of the joints: this didn’t help the appearance. The school next door is also claimed as being by George. Functional and well-used it may be, but the crude eyebrow sunshades over the main windows would surely not have been perpetrated by the architect of St. Stephen’s College. Outside Delhi, George designed the Council Chamber at Shimla, and the Law Courts and Umea Club at Jodpur. He was a founder-President of the Indian Town Planning Institute, twice President of the Indian Institute of Architects and founder of the Delhi School of Architecture. His life, work and contribution to Indian Architecture deserve to be better known, and appreciated through sensitive stewardship. The first sacred site visited was the Chapel of St. Stephen’s College designed by Walter George, which left no separate impression on me apart from that given by the main college buildings. We next visited St. Martin’s, A.G. Shoosmith’s design for a garrison church. It is an extraordinary building constructed of 3.5 million two-inch bricks: it has a tower and resembles a fortress with a suspicion of battlements and tiny slit windows. The interior is disappointing. Our reception here comprised the following sequence of events. The Lutyens party, whom I would judge to be a pretty successful bunch in worldly terms, came into the church and sat down. The Indian vicar welcomed us and distributed hymn books and invited us to sing Hymn 109, which turned out to be that well-known gospel hymn ‘What a friend we have in Jesus’. The Lutyens party most of whom had, I suspect, somewhere in the distant past received their education in Christian foundations, were nothing if not well-mannered, sang lustily. We then proceeded out on to the lawn for the first of a number of servings of chai (hot sweet milky tea) from an urn, together with biscuits arranged like soldiers on a parade ground. Our next church was St. Thomas’s designed by Walter George and originally intended for a congregation of crossing sweepers, the lowest of lower caste Indians, which today looks for all the world like an English parish church. Later on Sunday morning we were permitted to walk round the exterior of the Roman Catholic Cathedral of the Sacred Heart, designed by H.A.N. Medd. We had been allocated a fifteen minute slot between services to view the interior, which is remarkable for its series of arches which increase in size as they go upwards. However, this was squeezed into nothing and we watched as the congregation at a traditional Mass flooded out around us to be replaced by another full congregation for a sort of ‘happy clappy’ service, who sang modern choruses to the accompaniment of one man on his keyboard. Our last visit was to The Church of the Redemption, another Medd design in the ‘Wrenaissance’ style. While there we were invited, as at St. Martin’s, to climb up the tower, an extremely hazardous undertaking both of which in the UK would have been classed as a Health and Safety risk. As a member of the Church of England I was moved to find large congregations in lovely buildings thousands of miles from the UK, and it seemed a minor tragedy that Shoosmith and Medd returned to the UK in the thirties and after World War II respectively, to find no call for their professional expertise amid the Modernism prevalent at the time. Photographs by Andrew Barnett, Gavin Chappell and Richard Breese. Our love for the work of the great man is the only given when we embark on a Paul Waite organised tour. By definition we are eccentric and a very mixed bunch. Some of it has to do with the Englishness of the party. Having been on these tours before, there is a mounting expectation as you meet and rapidly or slowly get to know strangers whose passion for Lutyens matches or exceeds your own. And then you also have the pleasure of renewing earlier friendships. These meetings were for me an added bonus of a fabulous tour, New Delhi 2007. New experiences – India and my first venture with the Lutyens Trust. The privilege of seeing, breathing, absorbing so many evocative buildings, enhanced by the courteous welcome and hospitality were unforgettable. With our mutual interest uniting the group the companionship and rapport were stimulating, and new friendships were forged. I look forward to future Trust gatherings.